Representative John Tener of Pennsylvania, a former professional baseball player, organized the inaugural baseball game in 1909. The Boston Daily Globe observed, “The game was brewing for weeks and the Members of the House were keyed up a high pitch of enthusiasm. Deep, dark rumors were in circulation that ‘ringers’ would be introduced, but when they lined up at 4 o’clock the nine republicans were stalwart, grand old party men, while the democrats were of the pure Jeffersonian strain.” Democrats drubbed their Republican opponents, 26-16, for the first of six consecutive wins. Republicans won their first game in 1916. Due to its growing popularity, the Congressional Baseball Game was first covered via radio in 1928. The radio broadcast continued in succeeding years. The event has at times interrupted the work flow of Congress. In 1914, Speaker James Beauchamp ‘Champ’ Clark of Missouri became frustrated with the Congressional Baseball Game interfering with legislative business. An Appropriations bill on Civil War cotton damage was to be debated on the House Floor, but a quorum was not present. Speaker Clark sent the Sergeant at Arms to American League Field to return the Members to the House Chamber. When the Sergeant at Arms arrived, rain had already canceled the game. The House eventually achieved a quorum, but adjourned without making progress on the bill because Members remained preoccupied with their unfinished work on the baseball diamond. 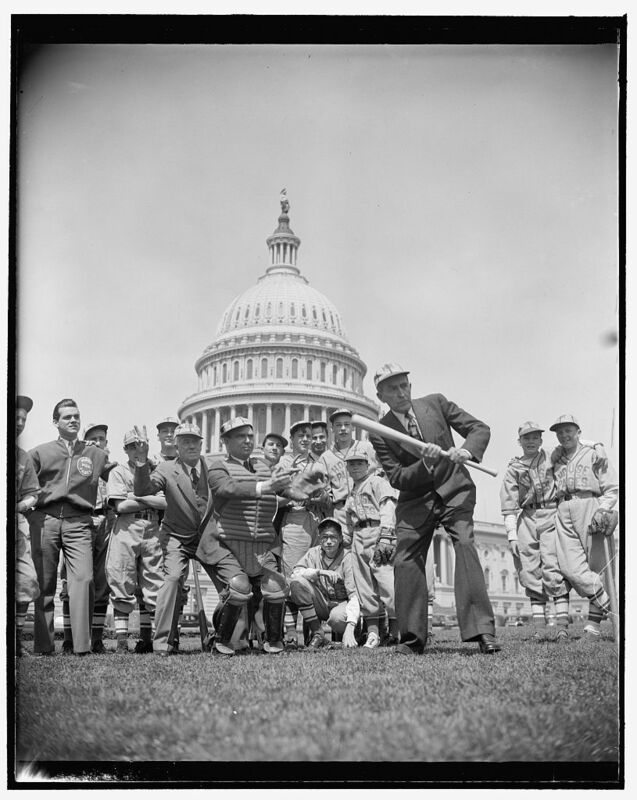 Congressional pages working in the House and the Senate each had their own baseball teams who practiced on the Capitol grounds. Despite its appeal, the annual game occurred intermittently because of interruptions due to the Great Depression, the Second World War, and intervention by the House leadership. For a while the game was held biennially, until the Washington Evening Star newspaper sponsored it annually from 1946 to 1958. Despite the sponsorship, Speaker Sam Rayburn of Texas ended the game in 1958. Rayburn contended that the game should be discontinued because it had become too physical. Speaker John McCormack of Massachusetts, revived the game in 1962 with the support of a new Capitol Hill newspaper, Roll Call. With the new sponsor, a best-of-five game trophy series was created, awarding The Roll Call Trophy to the team that won three of the five games. To date, 10 of these coveted trophies have been awarded, eight to the Republicans and two to the Democrats. The Congressional Baseball Game has been solidified in the history of this country, a bipartisan tradition enjoyed by politicians and citizens alike. Click here to learn about former Congressman Marty Russo’s memories of the historic 1975 Congressional Baseball game.